"is an introduction to a series which takes place in the distant future. The main character, Sam, is a space pilot and a knight. She is someone who wishes to explore, travel through the galaxy and doesn't feel at ease when back home, on Earth. She feels more free in the depths of space. During one mission Sam has an accident and she crash lands on a remote planet. From this point on a set of mysterious events take place which lead her to take action." (Ten Years of Sleep's official website). The soundtrack of the novel features seven songs of mine, including "Home of the Wondrous Spirits (Part III)", "Dæ, Mæ O Ål'sammel (You, Me and Everybody)" and "Als". Vyosoko Anime Production released the visual novel Invisible Apartment Zero as a prequel to the popular cyberpunk novel Invisible Apartment novel on iTunes in January 2015. 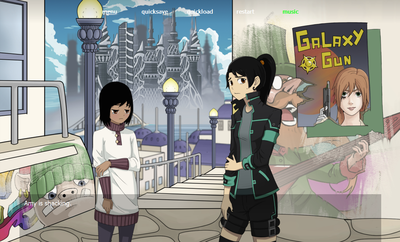 The visual novel is about "about the growing up of a girl from the suburbs who dreams of a life in the big city. It's also about a conspiracy, hacking, surveillance, but most importantly about friendship"